Anti-smoking ads are getting more and more graphic in an attempt to deter people from taking up smoking and encourage smokers to quit the habit. Graphic anti-smoking adverts, showing real images of people with cancer or living with other negative consequences of smoking, are a fairly regular sight, whether it's online or in public on posters. You'd think that it would be a pretty simple equation. 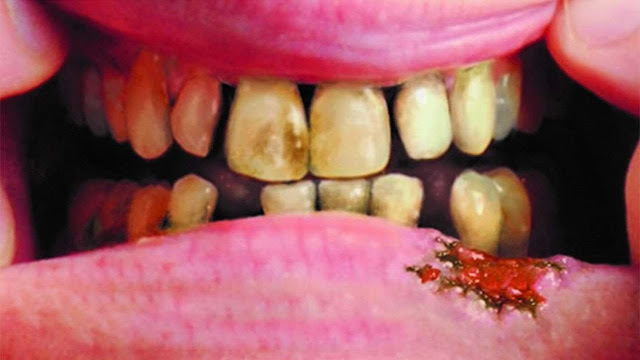 The more graphic images kids see of the negative consequences of smoking, the less likely they'll be to smoke in future. Unfortunately, a new study has found that may not be the case. In fact the latest study, published in the journal Nicotine & Tobacco Research, found that teens at risk of smoking are more likely to be at risk of smoking after seeing the posters. A graphic anti-smoking ad, from the UK. Public Health England. In the latest study, researchers from the Research and Development (RAND) Corporation recruited 441 kids between the ages of 11 and 17 and assessed their smoking risk (the likelihood that they'll go on to smoke in the future) using a survey. Once they were done shopping, they were again surveyed to assess their future smoking risk. Surprisingly, in many of the teens, their future risk of smoking had changed after shopping in the store. “We actually expected that the display of graphic anti-smoking posters in the retail environment would reduce smoking intentions among all teenagers,” lead author William Shadel told Fatherly. However, that wasn't the case. They found that in kids who had never smoked, the risk of smoking remained the same. However, in those who were already at risk of smoking (around 5 percent of children who had already smoked, and a further 20 percent who were deemed "at risk of future smoking" due to their questionnaire responses), the risk of smoking in the future had actually increased after seeing the advert. The researchers have a number of explanations. “It is possible that at-risk adolescents responded to the graphic warning posters in a defensive manner, causing them to discount or downplay the health risks portrayed in the poster,” Shadel said in a statement. Speaking to Fatherly, he also suggested that it could be good old-fashioned teenage defiance, rebelling against the anti-smoking message. Whilst the team said that a shortcoming of their study is that they didn't try a variety of anti-smoking posters, they said they believe that efforts may be better concentrated on different anti-smoking policies. “Our findings do suggest that policymakers should be careful when considering graphic warning posters as part of anti-tobacco education in retail environments,” Shadel said. “This type of action either needs additional research or potentially should be abandoned in favor of better-demonstrated anti-smoking efforts."